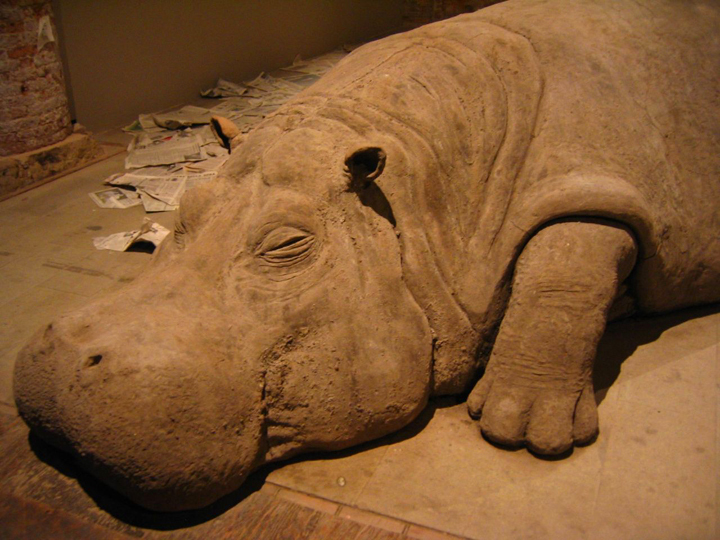 Images courtesy of Allora and Calzadilla. On September 8, 2010, the United States Bureau of Educational and Cultural Affairs announced that the artistic team of Puerto Rico-based Jennifer Allora and Guillermo Calzadilla, who have been working together since 1995, will represent the United States at the 2011 Venice Biennale. Allora and Calzadilla’s work playfully explores relationships among art, politics and international identity through performances, video, sculpture, photography, sound pieces, and social interactions. It’s interesting to note that they will be the first collaborators, rather than a single artist, to represent the United States and the first time that a combination of performance and installation will occupy the pavilion. This shift toward, a more interdisciplinary art, one hopes, will provide a new space for contemporary artists working outside traditional realms of the art world. This year marks the 54th Venice Biennale, which in many ways can be compared to the Olympic games of the contemporary art world. More than seventy nations are present. In 2009, Bruce Nauman represented the United States, before that, a posthumous Félix González-Torres. Allora and Calzadilla’s project for the Biennale will consist of six new site-specific works in a display curated by Lisa Freiman, chair of the Indianapolis Museum of Art’s contemporary art department. According to El Nuevo Día, Allora & Calzadilla will prepare six pieces to be placed inside and outside of the U.S. pavilion and will create works that “analyze contemporary geopolitics through the lens of spectacular nationalistic and competitive enterprises such as the Olympic Games, international commerce, war, the military-industrial complex, and even the Biennale itself”. Nomadism. Technology. Migration. Utopia. Body Politics. 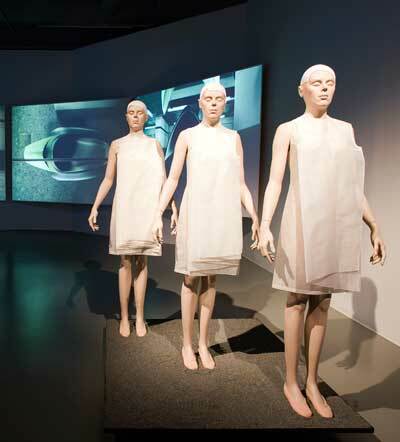 The myriad themes considered in the work of Hussein Chalayan are unlike that of any other contemporary fashion designer. 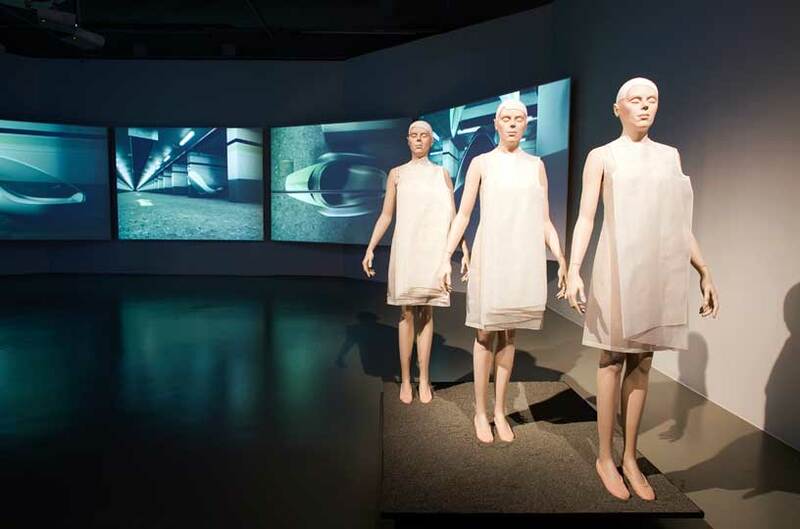 Hussein Chalayan uses fashion as a medium for presenting and discussing the semiotics of clothing. Chalayan interrogates standard cultural signs and materials by demystifying the common values related to fashion such as superficiality and frivolousness. After graduating from the Türk Maarif College, Chalayan continued his studies at London’s Saint Martin’s School of Art. For his senior thesis project in 1993, his Tangent Flows collection featured silk dresses that had been covered in iron filings, buried in the ground for months and then unearthed just before the show and presented with a text that explained the process. The garment’s rituals of burial and resurrection referred to life, death, and urban decay in material objects. This collection not only launched his career (his label was created only a year later in 1994), but helped him achieve global success as someone working between the complex mix of contemporary artist and fashion designer. Chalayan has twice been named British Designer of the Year and has received numerous awards and honors since Tangent Flows. In the first half of the 20th century, French philosopher Henri Bergson described duration as an invisible process, like sugar dissolving in a glass of water. Using this reference as a jumping-off point, the Paris-based artist Eric Baudelaire has created the film Sugar Water, which is presented at the Hammer Museum in Los Angeles for the artist’s first U.S. solo museum show. 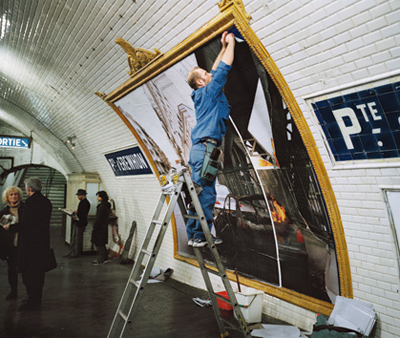 The film takes place on the fictional Paris metro platform at the fictional Porte d’Erewhon, where a billposter descends into the station to cover a large advertising billboard painted bright blue. He continues to wheat-paste a sequence of images that depict a common car parked on an anonymous Parisian street. He continues by then covering that image with one of the same car busting into flames. The billposter continues until the car becomes swallowed up in smoke, and then remains only as a burnt-out skeleton of the former car. All the while, metro riders enter and exit the scene seemingly oblivious to the slow-motion narrative action taking place. Baudelaire hired a real billposter to lay down the imagery, but the commuters who move in and out of the station are all hired actors, enacting a sort of role reversal in which the person upon whom the single camera focuses is not an actor; the “extras” who fill the background, meanwhile, are. Eventually, this cinematic event unfolds over the seventy-two-minute film, creating a slow reflection on images we typically experience in our news media.